Sachin Tendulkar needs no introduction to the sporting world. He is a global icon revered by millions across the globe. "Little Master" was arguably the biggest match-winner India produced. He shouldered the burden of Indian batting for a period of 24 years and played an active part in team strategies. His batting was based on three principles: balance, timing, and precision. Tendulkar proudly owns all the top records in cricket as a batsman and some of them will stand the test of time. He has scored 34000 runs in International cricket with 100 centuries and 164 half centuries from a whopping 664 matches across formats. However, the great man also owns a record for scoring the highest number of 90s. Sachin has 27 scores of 90+ with 17 of them coming in ODI's and the remaining coming in test cricket. India were facing off against Australia in the historic Wankhede stadium in Mumbai. Australia won the toss and chose to bat. They were bolstered by a 103-run opening stand between captain Mark Taylor and Mark Waugh. Waugh scored a well compiled 126 and held the innings together. Wickets at regular intervals did not allow Australia to build momentum towards the end and all they could manage was a competitive 258. India had a terrible start, losing opener Ajay Jadeja and Vinod Kambli in quick succession. McGrath had bowled 3 impeccable maiden overs and India had scored 7 in 6 overs for the loss of 2 wickets. Exactly at this point, Tendulkar began to cut loose and scored 3 boundaries of McGrath's next over by playing some glorious pull shots. He scored another 14 runs in McGrath's fifth over, which included his signature drives and a pick-up shot over long on which went for a maximum. 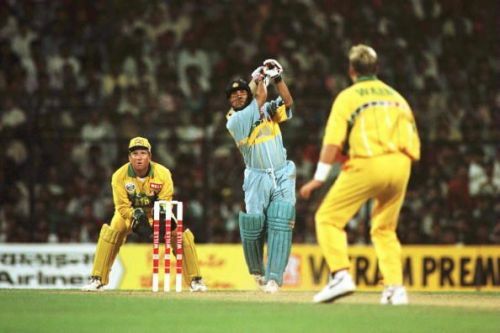 Warne's introduction had little effect on the rampaging Tendulkar as he smashed him for a boundary of the first ball he bowled. In the same over, he completed his 50 off a mere 41 deliveries. He was scoring boundaries at will and keeping the run rate under check. 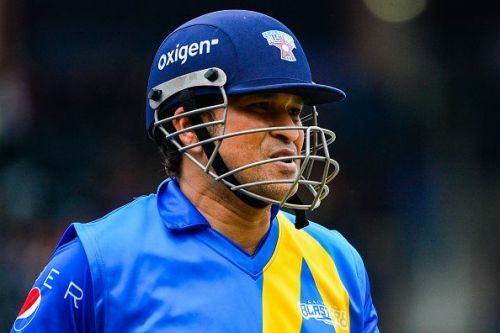 He had a 63-run partnership with Azharuddin and another 72 run stand with Manjrekar. When all was looking too rosy, he got stumped by Ian Healy off a wide by Mark Waugh's harmless off-spin. It was a masterclass from the great man, scoring 90 from 84 balls and his departure from the 22-yards sealed the fate of the game. India lost the match by 16 runs and continued its tradition of over-dependence on Tendulkar.